Lap sidings can be installed horizontally or vertically. For horizonal applications, start with the bottom course and work up with the bevel sides of the channels pointing upwards. Allow a 1/8 in. 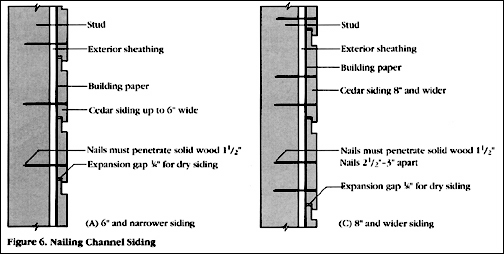 expansion gap between pieces if the siding is air-or-kiln-dried. Do not nail through overlaps. For siding up to 6 in. wide, use one nail one inch up from the lap. Face nail with two nails per bearing for 8 in. patterns and wider, keeping nails 2-1/2 to 3 in. apart to allow for dimensional movement without splitting (see Figure 6).